With an academic background in the Humanities (PhD in Linguistics), Ms Giannini became Professor of Linguistics in 1992 and served as Rector of the University for Foreigners of Perugia (2004 – 2012), being one of the first female Rectors and the youngest at that time in Italy. During these years, Ms Giannini coordinated a number of relevant international projects in the field of higher education and research, contributing to the improvement of university cooperation between Europe and several other countries, from the United States to countries in Asia as well as the Middle East and North Africa region. 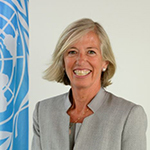 In addition to her current position as UNESCO’s Assistant Director-General for Education, Ms Giannini is Advisor to the European Commissioner for Research and Innovation as well as a member of the Atlantis Group of the Varkey Foundation and of RISE (Research, Innovation and Science Policy Experts).